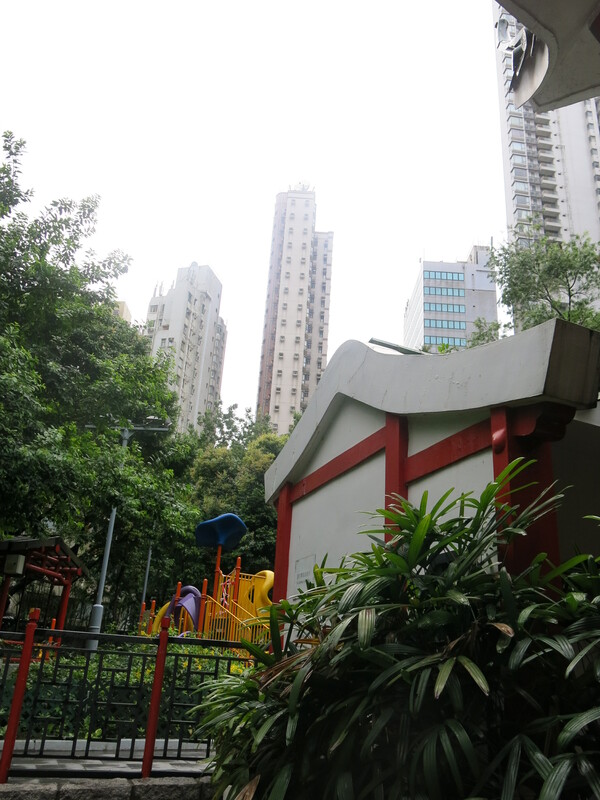 Living in Mei Foo, and with Tsim Sha Tsui more easily accessible and convenient for us, we don’t venture onto Hong Kong Island all too often unless we have a reason to. Usually the reasons involve heading to Wan Chai for immigration, or tax, or embassy purposes, but occasionally someone has a leaving do and we trundle over and take advantage while we’re there of visiting places or seeing things we normally can’t be bothered to justify an explicit visit just for. 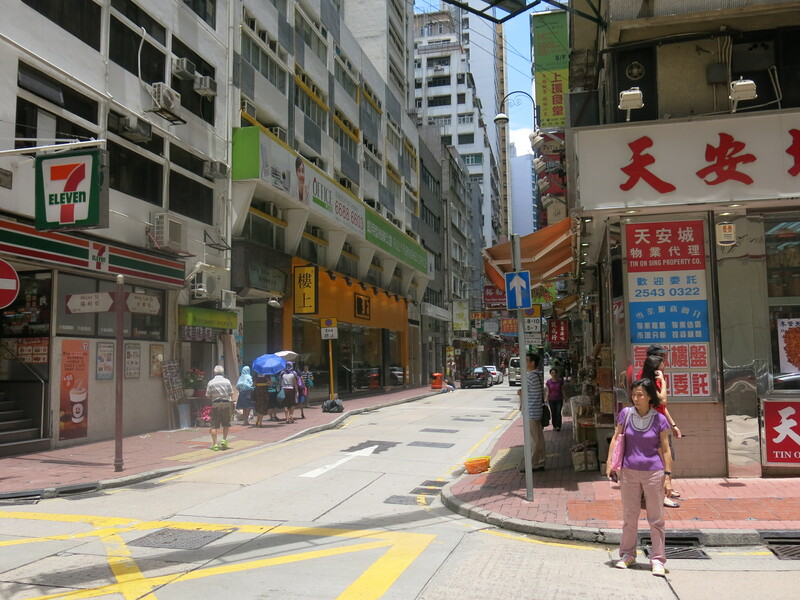 Last weekend was just one such visit, and we found ourselves on Hollywood Road, famous for it’s antiques shops, the Man Mo temple and its use in the area name SoHo, meaning South of Hollywood Road (towards the centre of the island, and heading sharply up the hill). I’d only really looked around Sheung Wan, the area to the west of Hollywood Road, when I first arrived in HK last August, and then it was too hot to do much looking around, and was more searching for an area with air con and a cool drink, and I’d wanted to go and see Possession Point, the area of Hong Kong where the British first hit terra firma when they arrived in 1841. I wasn’t entirely aware of where exactly Possession Point was, but thought it was out west somewhere. A quick look at a smart phone would have cleared up the matter instantly, but my network was blocked by my Japanese provider and I’ve only been able to use the internet on my smart phone through Wifi in the flat or at work. We thought it wise in heading out west to take the Queens Road escalators, the world’s longest covered escalator, up the hill and walk down, rather than need to walk up the hill later on. 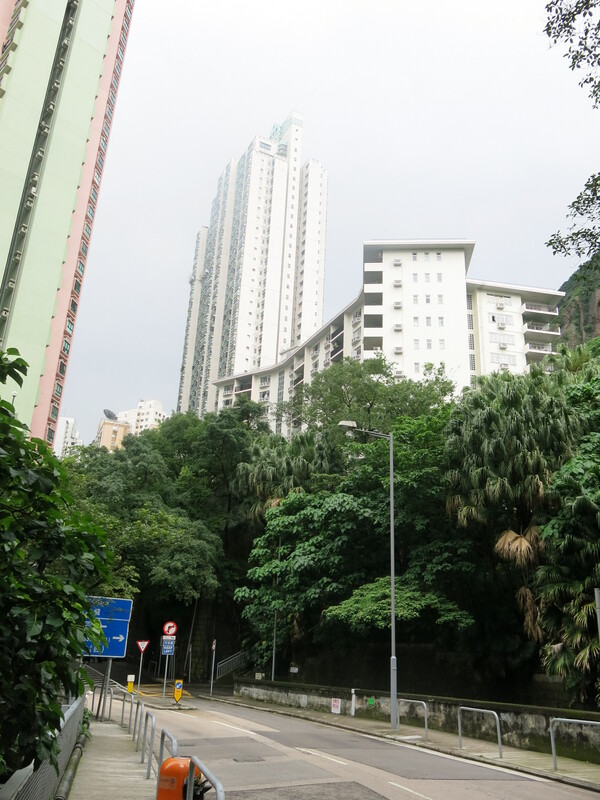 Curiosity overcame us, and we realised that in a year in HK, we’d never actually been to the top of the escalators, only about half way up where the bars and the Sun Yat Sen Museum is. Reaching the top of the escalators, we headed west along Conduit Road, past lots of des res tower blocks, with golden gates, and names like “Peace Plaza” and “Tranquility House”. Trying to get a glimpse of the harbour from our new found height was impossible due to the density of the buildings even halfway up the hill at Mid Levels, and it’s a bloody steep hill. We kept walking along trying to find a path back down, and stumbled upon a little ‘sitting area’ off the main road. We couldn’t see an exit from the road, but were sure that having to go down some steep steps to get into a parky area with trees and benches, there must be an exit down the bottom somewhere. There wasn’t, so all the way back up to the top we came. It was pretty humid by now, 4 o’clock on a Sunday, although we’d been lucky with the weather as it had poured down earlier in the day. With there not looking like being an escape path in sight, we ended up catching a taxi and enjoying the air con luxury as it took us to Kennedy Town, to the very west of the island and at the bottom of the hill again. In Kennedy Town, we popped into McDonalds as we needed the toilet, and in there checked on the free wifi a map of where this place was actually supposed to be. 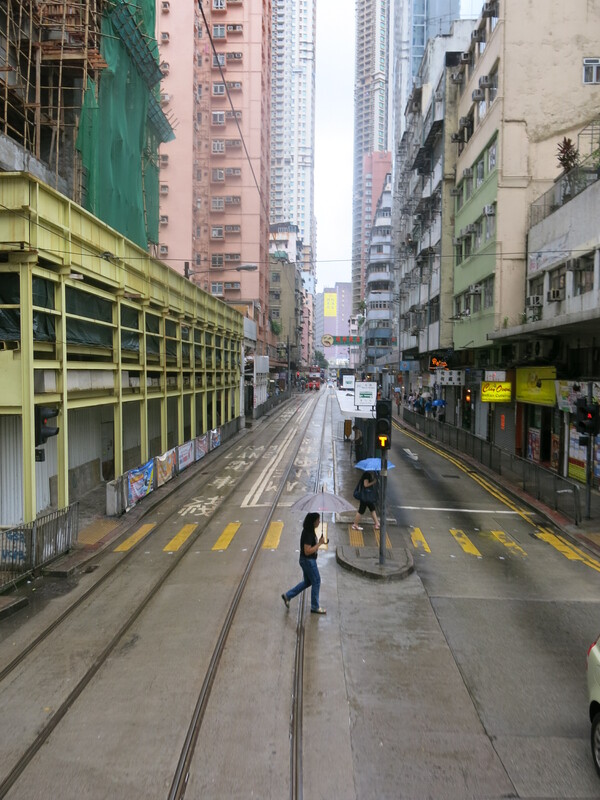 Cue nervous laughter as we see it was back towards Sheung Wan, and actually very near Hollywood Road where we’d started off our trek what must have been an hour earlier. At which point the heavens opened again and we were stranded with no umbrella. Twenty minutes or so later, the rain looked like it had eased off, but just to be sure we bought another from 7/11 and we went to take a tram back towards Sheung Wan and Central, and so to Possession Point. Not knowing where to get off, we did so too early and had to ask directions again in a hotel, and the concierge had never heard of the place! Finally, exhausted and a mix of wet and sweaty (the 7/11 umbrellas are rubbish) we stumbled upon a sign pointing back to Possession Point! We’d finally found it! Well before any reclamation of Victoria Harbour, the shortest crossing between western Hong Kong Island and the Tsim Sha Tsui headland was the original shorefront near present day Queen’s Road Central and Wellington Street. The area was a natural landing place for boats and as a result, this was the site or it is said, of a ferry jetty in pre-colonial times. It was here that sailors from the Royal Navy landed 26 January 1841. The naval party walked up a small hillock just above the landing spot, raised the Union Jack, and claimed possession of Hong Kong Island. 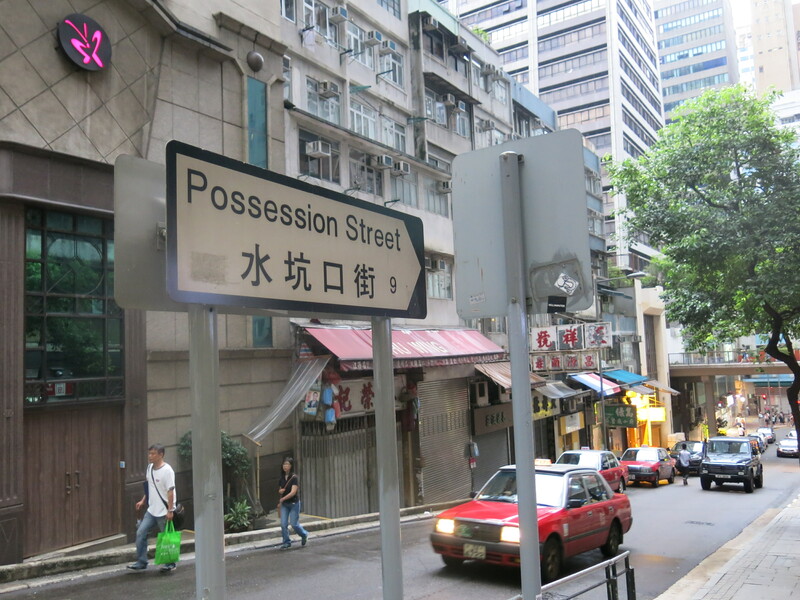 Understandably, this area became known as Possession Point, and today’s Possession Street reflects the old name. Possession Street soon became a densely packed residential area. Possession Point, originally left as an open space, eventually became a maze of fortune teller stalls. 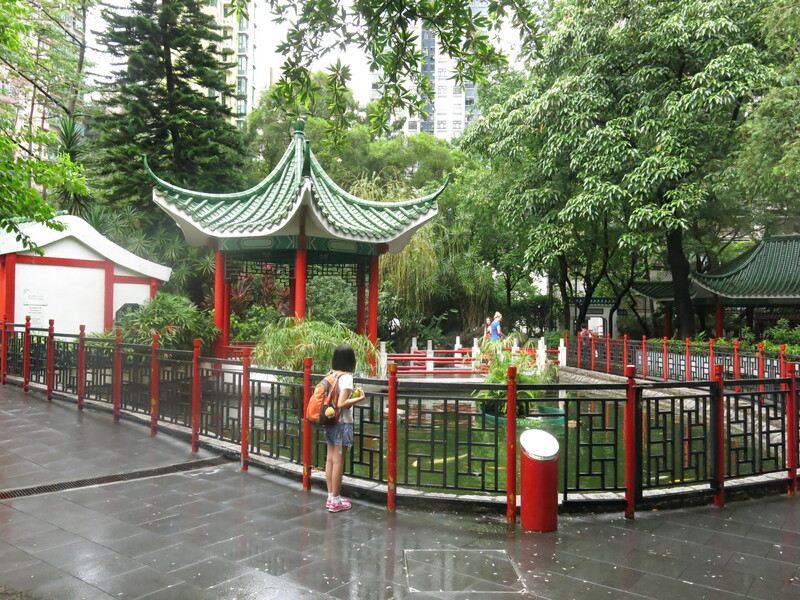 In time, Possession Point was redeveloped into a Chinese-style garden and renamed Hollywood Road Park.